Perhaps the easiest place for foreign entrepreneurs to set up a business in the EU is not London, Paris or Frankfurt, but Tallinn. For €100 ($119), anyone can become an ‘e-resident’ of Estonia, allowing them to run an online company based in the single European market without ever setting foot in it. So far more than 22,000 people have taken up the offer - including more than 1,000 Britons since last year’s Brexit vote - spawning 3,536 firms. The goal is to have 10 million e-residents, almost eight times Estonia’s population, by 2025. The ambitious initiative is just one example of the way Estonia has transformed from Soviet republic to digital pioneer in the quarter century since independence. Information technology companies now account for 7% of GDP and the World Economic Forum ranks Estonia’s government as the most tech-savvy in Europe. WIRED, the technology magazine, has described the country as the most digitally advanced in the world. ‘e-Estonia’ (as the project is officially known) aims to make government more efficient and transparent as well as boosting economic growth. Every citizen has a secure digital identity that enables them to file tax returns, check their health records and vote. Indeed, according to the Central and East European Management Development Association, Estonians can do everything online other than marry, divorce and buy a house. The system relies on a high degree of trust in institutions - remarkable in a country that lived under Soviet rule for almost 50 years. “Our goal is to make it impossible to do bad things,” Toomas Hendrik Ilves, the outgoing president, told the Guardian in 2016. His successor, Kersti Kaljulaid, believes Estonia’s computing prowess allows it to punch 10 times above its weight in international affairs. But she would love to export this model to the rest of the EU, and Brexit presented a chance to do so. The UK was due to take up the rotating EU presidency in June, but after voting to leave last year it stood aside, letting Estonia take up this mantle - and shape the EU’s agenda - for the first time. Ms. Kaljulaid and Juri Ratas, her prime minister, want to use their six months in charge to foster a “digital Europe”. Running through Estonia’s programme are digital solutions such as making it easier to share electronic evidence between member states and promoting e-government in both the EU and its neighbours. Among other things, it plans to encourage cross-border e-commerce by modernising VAT and to hold a “broad debate” about allowing data to move across borders alongside the EU’s four traditional freedoms - goods, services, capital and people. Estonia’s leaders acknowledge that this is a “colossal and difficult undertaking”. Plenty of other European countries - including Latvia, Sweden, Denmark and Ireland - are technologically advanced. Half of all published scientific breakthroughs take place on the continent. 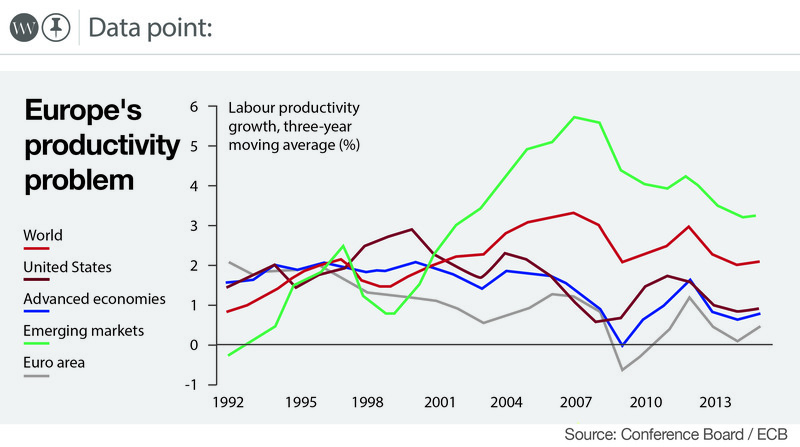 But the EU lacks nerve centres such as Silicon Valley and has missed out on the computing-powered gains in productivity that the US has enjoyed since the mid-1990s. “If it persists, this slowdown in productivity growth will matter greatly for our future prosperity,” Mario Draghi, president of the European Central Bank, said last year. He argued that “the picture appears to be not so much a lack of technological progress per se, but a lack of diffusion” from cutting-edge firms to their more pedestrian peers. If it continues, this malaise will inflict a nasty blow on living standards because of Europe’s ageing population. Brussels has long been aware of this danger. In 2000 the Lisbon Agenda promised to turn Europe into “the most competitive and dynamic knowledge-based economy in the world” by 2010. This flopped and was succeeded by Europe 2020, a new 10-year plan that among other things aims to create to a ‘digital single market’ with no online barriers to flows of goods, services and data. So far this has proved more successful, and the project notched up a big victory in June when mobile roaming charges were scrapped. The European Commission described this as one of the “greatest and most tangible successes of the EU”. But despite being almost universally popular the policy was held up by intense lobbying and took 13 years to bear fruit. Plans to stop firms discriminating against customers from different member states - for example, blocking them from watching a film online or charging them more for a book - are proving similarly torturous. The clock is ticking and the digital single market is far from complete. Can Estonia inject some momentum? Philipp Lamprecht, senior economist at the European Centre for International Political Economy, told TWW that its proposals are valuable but must be accompanied by an attempt to sell the benefits of digitisation to “laggards”, most notably France and Germany, that are “sceptical or even fearful”. Tallinn is in a strong position to counter one common objection, that e-commerce and e-government put data at risk, because it has developed an incredibly secure system, based on blockchain, since suffering the world’s first major cyberattack in 2007. But the EU can only do so much. Dr. Lamprecht thinks “digital frontrunners” (including Estonia, Latvia, Denmark and Ireland) must forge ties with “convergers” such as the Czech Republic, Hungary, Spain and Portugal, which are keen to embrace the digital economy but have not invested as much in infrastructure such as broadband. However it chooses to go about it, it is clear the EU must embrace digital technologies to stand any chance of competing with the US and emerging economies in Asia in the 21st century and beyond. The European Parliament reckons that a fully functioning digital single market would add €415 billion to GDP and create hundreds of thousands of jobs every year. In the meantime, however, Estonia may find itself with many more e-residents.